Is it bad to be annoyed that I don’t hate José Padilha‘s ROBOCOP remake quite as much as I expected to? Don’t get me wrong, it’s bad, but not THE AMAZING SPIDER-MAN 2 bad. In an updated take on the dystopian crime film, we once again follow Detective Alex Murphy (Joel Kinnaman) a good cop working in the crime-infested near-future Detroit. The US Senate has repeatedly blocked bills to allow for the ranks of the police to be bolstered by intelligent robot agents, and the OmniCorp technology conglomerate headed by Raymond Sellars (Michael Keaton) see a lucrative business opportunity when Murphy is mortally injured in an attack on his home. Murphy is transformed into RoboCop, the first successful fusion of man and machine, and rejoins the fight against crime while simultaneously trying to reconnect with his young family, and himself. The film’s attitude to the justice system in the USA (including their policing of the world) is so cruel and cavalier that it’s difficult to tell whether the filmmakers are joking. This wouldn’t make for bad (if incredibly unsubtle) satire if they were kidding, but I don’t always get that sense. Samuel L. Jackson’s current affairs TV personality proclaims in the film’s opening sequence that without relying on robots to do the dirty work abroad, “it would be American soldiers pacifying these people”. “These people” in this case are the citizens of Tehran, who apparently require American pacification in this film’s universe (with no explanation given for why, beyond the US/Iran troubled relationship). Jackson’s character is a parody of a certain kind of political commentator, just not a particularly clever one. Also in the opening sequence, we get Iranian suicide bombers laughably spelling out to each other, and to the audience, that “our goal is to die on television”. OmniCorp’s evil marketing team (headed by Jay Baruchel) rarely say anything that isn’t re-stating how nasty and money-obsessed they are (“we’re gonna make a lot of money” Baruchel’s character beams) and there’s even a scene that sets out their super-evil re-branding strategy before they casually mock their disabled potential RoboCop test subjects for not being white or muscular enough (just in case we were still in doubt about who the bad guys are). At least in Paul Verhoeven’s original, the OmniCorp baddies were just guys in suits who got on with the business of being evil rather than talking extensively about it. Jackie Earle Haley is entertaining as the army’s sneering robo-expert, but you don’t get extra points for Haley turning in a good performance any more because he’s great in everything. In contrast to the pantomime villains and boring protagonists (Kinnaman is certainly no Peter Weller), we have Gary Oldman playing a jolly nice doctor who helps amputees get used to using their new prosthetic limbs, and setting up the film’s main story arc (“too much emotion will throw the system”) as well as providing general exposition throughout to make up for some bad storytelling. I do understand why the filmmakers repeatedly reference the military drone concern – for a contemporary audience, it’s still a raw subject and gives the film a little added clout. I also appreciated the reprisal of the iconic theme tune from the original films, and I liked that an updated version of the original suit makes a brief appearance, if only they didn’t paint it a generic black to turn him into a poor imitation of Batman just because Michael Keaton (still seemingly obsessed with his most famous role) said so. The choice of song to play over Robo’s final training exercise also has an odd brilliance to it, and I’m amazed it hasn’t been used to punctuate and provide rhythm to an action sequence before. Elsewhere, the action is unremarkable. There’s a big shootout that is essentially a re-tread of the Verhoeven film’s finale, but without creativity and wit, in total darkness illuminated only by gun-flare and infra-red. It does perhaps provide a justification for Robo’s new “tactical” stealth bomber look, but then you have to ask why he has a glowing red Cylon visor to give his position away. What I didn’t like about the film was that it took itself so damn seriously. 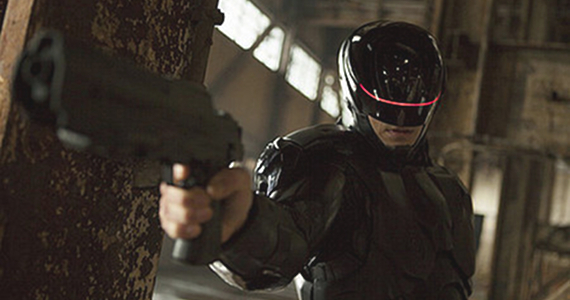 RoboCop was always high-impact and ultraviolent (for good reason) but it was never gritty (again for good reason). The humour, gore and razor-sharp satire struck a perfect balance in ’87, but here we have something slick, grim and ultimately, really dull. I don’t honestly think you can make a good film about violence without showing violence. Violence is depicted here, sure, but it’s neutered violence, edited in such a way to achieve the desired certificate to boost profit margins. Here we can almost entirely blame the well-publicised studio interferance, but it’s still a problem that affects the film as a whole. Robo’s “birth” scene in the original film was horrifying and personal – he looked into his murderer’s eyes as they brutally tortured him and eventually took his life, and we were right there with him. Here, he’s blown up in wide shot by persons unknown, and we’re meant to be behind him again when he goes after the culprits, despite the fact we actually haven’t seen them commit crimes, but just have to trust what we’ve been assured happened off-screen. The only real laughs come from the bizarre combination of Sam Jackson’s vocal warmup exercises coming out of the MGM lion, and from “If I Only Had a Brain” playing over one of Robo’s training simulations. A tweaked “I’d buy that for a dollar” is not funny. The only even vaguely affecting scene is Murphy’s gradual waking from his coma dreams as his comfortable, vital suburban life morphs around him into a cold, dead laboratory around him (a decent metaphor for his character). In the other family-based scenes, Padilha and co need to learn that it takes more than a simplistic piano theme to elicit an emotional response from the viewer. We have to be made to care about the characters, but here Alex Murphy and his wife and son (Abbie Cornish and John Paul Ruttan) are just too bland. This entry was posted in Film, Film Review and tagged Abbie Cornish, Action, Film, Gary Oldman, Jackie Earle Haley, Jay Baruchel, Joel Kinnaman, John Paul Ruttan, José Padilha, MGM, Michael Keaton, Movies, Paul Verhoeven, RoboCop, Samuel L. Jackson, Sci-fi, The Amazing Spider-Man 2. Bookmark the permalink.